I've wanted to draw Wolfwood as a girl for a while, yet I'd never had any time to do so-and this is the only drawing of "her" I've done so far that I'm really happy with, so c'est la vie! (that's life!). My sincerest apologies if you have issues with a transgendered character(happens all the time in Ranma 1/2, though), please, bear with me :sweat:. I'm also aware of how many errors there are-even after going through the wringer with MS Paint. dude, it looks GREAT! I always love your drawings! 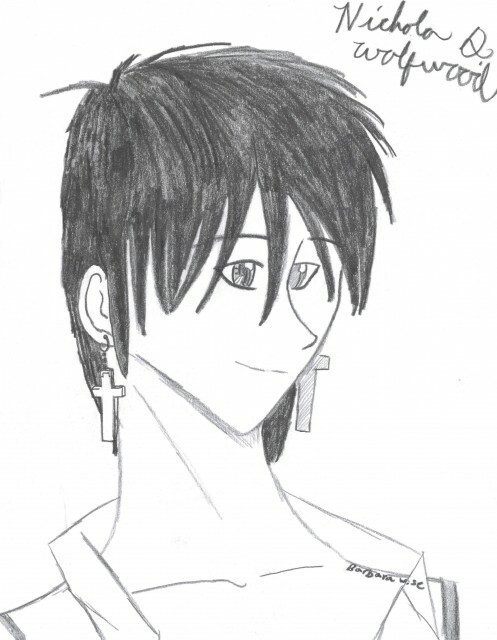 owwooo a girl verson of the bisouneni Wolfwood *drools* well anyways I love it! good job. keep up the good work! im looking forwards to seeing more from you! once again, a very lovely piece. 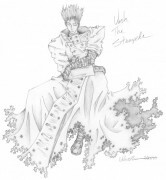 I never watched trigun before, but your doujinshi here looks very nice. I really like the cross erings :D good job sweetie and keep up the good work! Hehehe, Nicholas in girl form aye? Looks pretty good. Although, how'd you make the hair, did you use all pencil or did you also use marker for the shading on the hair...I really can't tell. Also, I think you should seperate the eyes a lil bit, they look a bit too close to eachother. Oh and I think the doujin would look cooler if you gave her a pair of glasses like the actual Nicholas has. Just make her pair err... feminine. Yeah, the eyes are a little too close together, aren't they? The pencil I used was an art pencil, black, and I think you can find it in craft stores, like Beverly's, do they have one where you are? Anyway, I should've explained this, but this was done in one night, while I was waiting for something to digest...yeah, gross, I know^_^; The art pencil I mentioned before was the only thing I used: no rough draft, just the pencil, a need to fill a boredom, and hope. Thank you so much for the constructive criticism; yes, glasses would look great, wouldn't they? Don't worry-I'm planning on a lot more for subsequent renderings of Miss Wolfwood:).